This paper analyses impacts of the federal system and the decentralisation of functions to the district level on Ethiopia's socio-economic development. Firstly we will highlight the principles of the Ethiopian federal system as well as those of the 2001/2002 decentralisation process. Secondly we will show how the decentralisation has impacted on two of the decentralised sectors, health and education, by comparing pre-federal, pre- and post-decentralisation data. In both cases an overall increase in allocated budgets and an increase in the scale of the services offered since decentralisation started in 2001 has been found. Studies also show that the increase in services is not homogenous across regional states. Within the four larger regions, strongly disadvantaged woredas at the outset of the decentralisation process have profited most, which shows that the constitutional imperative of equal access to services is being implemented. Some of the regions where decentralisation was started later have still not caught up with the other regions, a phenomenon which is mostly due to capacity deficits. The article concludes that decentralisation in combination with consistent development policies has led to an overall improvement in service delivery, while some challenges regarding quality and equity still need to be addressed. Ethiopia underwent a dramatic system-change after the defeat of the military regime that had ruled the country between 1974 and 1991. While Ethiopia is characterised by significant diversity in terms of ethnicity, language, culture and religion, its previous emperors, Menelik II and Haile Selassie, had subjected the country to the principle of "one language, one culture, one religion, one nation". Assimilation and suppression rather than integration were the governing principles. While the military regime, the so called Derg-regime, addressed some of the ethnic issues at the end of its rule, giving the populace democratic choices was not contemplated. After the military defeat of the Derg-regime, which was achieved through a coalition of ethnically-based armed groups, the principle of ethnic self-determination and a democratic order became preconditions for the maintenance of a polity within Ethiopia's boundaries, thus making space for diversity. Between 1991 and 1995 the country was governed on the basis of the "Transitional Charter", which held up to the self-determination principle and provided for decentralised organisation. Federalism was chosen as the glue to hold the country together, while the principle of self-determination was preserved within this system. The state-organisation has also had to respond to the need for development. For this reason a range of services have been decentralised from regional state level to district level, starting in 2001. Ethiopia's approximately 74 million citizens belong to more than 75 different ethnic groups1which are - because of their historical independence and their distinct systems of governance - referred to as "Nations, Nationalities and Peoples". During previous regimes, this distinctiveness was widely seen as a threat and was suppressed under the slogan: "One nation, one language, one culture". After the defeat of the Derg military regime a complete shift in paradigm was undertaken. Instead of seeking unity through assimilation, unity was going to be achieved through the accommodation of diversities of all kinds, granting equal rights and status to all of the groups in the country. The most important principles in this process have been the right to self-determination and equality. The Constitution of the Federal Democratic Republic of Ethiopiabuilds on four central principles: the right to self-determination, the sovereignty of the Nations, Nationalities and Peoples (NNP), equality, and equity. Figure provides an overview of the principles and their interdependent relationship. 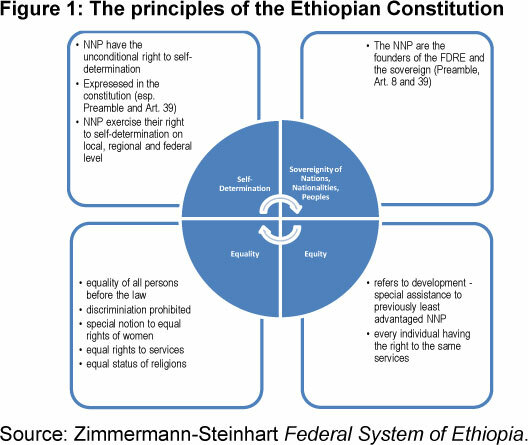 These four principles are the determining factors for Ethiopian federalism and the decentralisation of functions to district level. Based on these principles, the Ethiopian polity consists of nine regional states and two city administrations. The regional states basically follow ethnic settlement patterns. While some of the regional states consist of a majority ethnic group, none of the regional states is completely homogenous regarding their ethnicity. The Constitution assigns mandates to the regional states (Article 52) as well as the federal government (Article 51), leaving the residual powers with the regional states (Article 52 (1)). Among other powers, the regional states enjoy cultural and linguistic autonomy. The mandates of the regional states are: ensuring self-government and the continuance of the democratic order based on the rule of law; exercising responsibility for socio-economic development policies; policing and public security on the state level; levying and collecting the regional taxes; and managing the regional civil service. In order to finance their mandates, the regional states levy taxes such as income taxes, land use fees, and profit, sales and excise taxes of state-owned companies (Artcile 97). However, the income generated by the regional states is not sufficient to cover their costs, which creates a vertical imbalance which is addressed through a formula-based fiscal equalisation system. This system was designed and decided upon by the Upper House of Parliament, the House of Federation, which represents Ethiopia's nations, nationalities and peoples. The powers of the regional states enable them to find adequate local solutions, but in practice the variation across regional policies, ranging from their constitutions to their policies, is relatively small. The limited variation has been seen as an effect of party discipline by some authors,2and may otherwise also be interpreted as a function of development goals and unequally distributed capacities. A decentralised governance system is not unfamiliar to Ethiopia. In its pre-modern era the country had enjoyed a traditional system of governance that resembled some kind of federal or confederal arrangement. Throughout this period warlords and nobilities at provincial and local levels had almost complete autonomy over the territories they controlled. The most that was expected from them was to acknowledge the imperial throne as the central authority and to pay a certain tribute. The second half of the 19thcentury marked the start of the centralisation process. The process began with an attempt by Emperor Tewodros II (1855-1868) to create a centralised and unified modern Ethiopia. The attempt was then further pursued by emperor Menelik II, who consolidated the different parts of what was now Ethiopia through the process of forced inclusion and assimilation of the diverse peoples of the country3. It was during the reign of Emperor Haile Selassie (1930-1974) that the process of centralisation reached its peak. As one commentator puts it, the current Ethiopian decentralisation is "a relapse into the customary and traditional mode of governance of bygone days. "7The relapse began with the establishment of a federal system, first via Proclamation No 7/1992 of the Transitional Government and then codified in the 1995 Federal Constitution. The principal aim of the new federal arrangement is to provide the various ethno-national groups - 'Nations, Nationalities and Peoples' - of Ethiopia with the power to govern themselves while at the same time maintain the unity of the country through a mechanism of shared rule. Through the Federal Constitution, the diverse cultural and linguistic groups of Ethiopia have been accorded the right to almost all aspects of self-determination. This was the beginning of the first phase of decentralisation, which resulted in the creation of regional governments mainly on the basis of 'ethnicity' and settlement patterns, with most of the regions named after the dominant nationality in the state. The Ethiopian federation consists of the federal government, nine ethnic regional states and two city administrations. The regional states are Afar, Amhara, Benishangul Gumuz, Gambella, Harari, Oromia, Somali, Southern Nations, Nationalities and Peoples (SNNP), and Tigray (Article 47/1). Addis Ababa and Dire Dawa are established as autonomous cities through the constitution (Article 49) and a federal proclamation respectively. Ethiopia adopted a dual federal system in which most of the executive powers of each level of government are coexistent with its legislative powers. Article 50(2) of the Constitution proclaims that each level of government must have legislative, executive and judicial powers. The division of powers suggests that the legislative and executive powers of each level are parallel, except in areas of land and natural resources. Articles 51 and 52 of the Constitution define the powers and functions of the federal and regional governments respectively. In Article 51, more extensive powers are exclusively assigned to the federal government. These include foreign affairs, national defense, financial and monetary policy, air, rail and water transport, inter-state commerce, patent and copy rights and nationality-related issues. Areas such as economic and social policies, education, public health, land and natural resources, civil law and peace and security fall under concurrent jurisdiction. Regional governments also have robust powers. Apart from certain exclusive powers such as ensuring the continuance of self-government and democratic order, they are entrusted with residual powers. As per Article 52(1), "all powers not given expressly to the Federal Government alone or concurrently to the Federal Government and the States are reserved to the States." The Ethiopian decentralised governance system now has five levels of government, i.e., federal, regional, zonal, woreda and kebele governments. All levels of government except zones have a tripartite structure: an elected council, an executive organ and an independent judiciary. With the exception of the SNNP region and certain regions with more than one nationality, where they have elected cabinets, zones do not have a legislative organ. In regions with a strong majority nationality zones are deconcentrated arms of the regional government, being responsible for coordinating and monitoring the activities of woredas (see the regional constitutions for further details). Ethiopia has been among Africa's worst performing countries regarding the development of the education sector for a long time, with respect to accessibility, performance and relevance.12The first major attempt to broaden education was made during the Derg regime, resulting in a 100% increase of children attending primary school between 1974/75 and 1985/86. 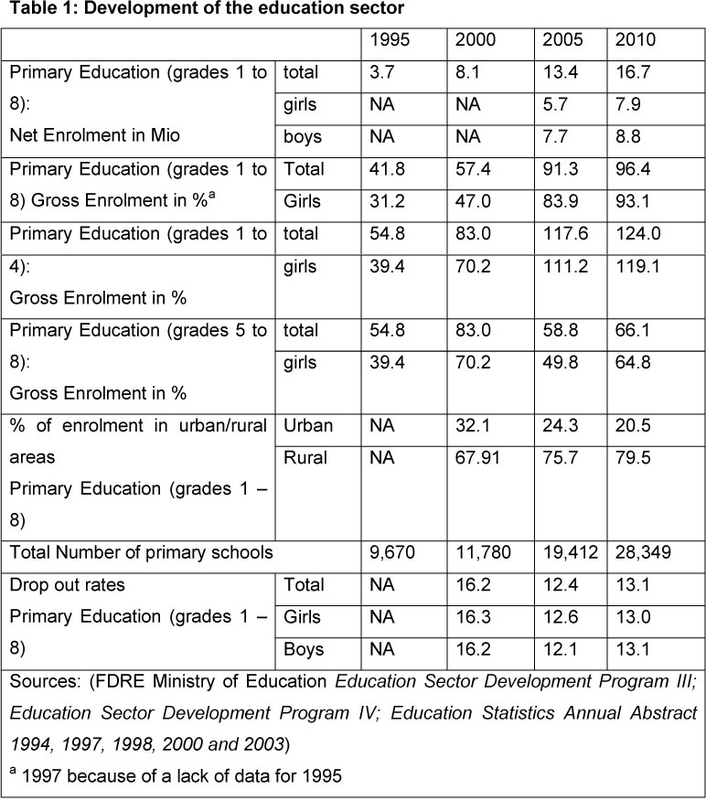 In 1991 33% of the younger children were enrolled in primary education and 5.3% of their seniors in secondary education. Education was available in agglomerations of significant size, resulting in the need for children to travel long distances to attend school. In 2011, however, 96.4% of the younger children were enrolled in primary education, 38.1% of their seniors in secondary education, primary schools being available in every kebele. Since the decentralisation process mainly concerned primary education, this section of this article focuses on this aspect of the education sector, while other areas are barely touched upon. The Constitution contains a number of provisions relevant for the education sector. First of all it guarantees each of the nations, nationalities and peoples of Ethiopia the right of cultural identity, including to right to speak, write and develop their language (Article 39 (2)). Additionally, Article 90(2) stipulates that education has to be free from any religious influence, political partisanship and cultural prejudices, and finally Article 41 requires the provision of equal access to social services and obliges the government to allocate ever increasing resources to provide health, education and other social services. With regard to education, the federal level of government sets standards and policy criteria for all areas of education. It monitors the performance of the regional states. Further, it is responsible for the establishment and the administration of institutions of tertiary education (Article 51(2,3). The federal government provides technical and professional support to the other levels of government, for example in curricula development. The regional states are responsible for the implementation and adaptation of these curricula to regional needs. One of these aspects is primary education in languages other than Amharic in order to implement the constitutional imperative of self-determination, of which cultural self-determination is one important factor (Article 39). The regions develop the curricula for primary education and ensure that national standards are met. Zones and regions are further responsible for the establishment and administration of the second cycle of secondary education (grades 11 and 12), special schools, technical and vocational schools, teacher training institutions and medium-level colleges. The regions print and distribute textbooks for these institutions of education. Since the start of the woreda decentralisation, woredas have been given great responsibilities with regard to the provision and administration of basic education services including primary education (grades 1-8), secondary education (grades 9 and 10), and adult education. Within these areas woredas are responsible both for planning and implementing educational plans. They have to ensure the provision of equitable access to education, which includes the planning of new schools, and the hiring and deploying of teachers. In doing so they have to ensure that they meet the standards set at regional and federal level. Woredas supervise schools, print and distribute textbooks. Additionally, woredas are responsible for establishing and administering boarding schools for primary education. Woredas supervise both government and non-government schools. There are many challenging constraints regarding the overlapping mandates of regional states, zones and woredas, and issues arising from their unequal capacity. Decentralisation plays an important role in the ESDP. As stated above, decentralisation has been organised in stages. In 2000 the responsibility to manage schools and to issue regulations in this regard was transferred to regional governments and the governments of the two city administrations, Addis Ababa and Dire Dawa. Since the woreda decentralisation first started in the four bigger regions, mandates have been transferred as described above. The decentralisation and the development of the Education Sector Development Plans were expected to improve the efficiency of the provision of services in this sector. A World Bank Working Paper16analysing the effect of decentralisation in two of the pioneering regional states, Oromia and SNNPR, shows that the decentralisation had the expected effects. First of all the spending on education has been significantly increased, especially in the formerly least developed woredas. The increased spending then positively impacted on service delivery, as we can see from the enrolment rates shown in Erro: Origem da referência não encontrada. Table 1 provides some quantitative and some qualitative indicators regarding the development of the education sector since 1995. The first figure shows the growth of students in primary education in absolute figures. This accounts for both population growth and the intake capacity of schools. The second category is the gross enrolment for primary education, which also significantly increased after 1995 from 41.8% of the school-aged population to 96.4% in 2010, showing the highest increment in growth between 2000 and 2005, which was the period of decentralisation. The ratio between education in rural and urban areas, which is also given in Table , also indicates the positive impact of decentralisation on the provision of primary education. About 80% of the Ethiopian population live in rural areas. The fact that the gross enrolment in the rural area accounted for 79.9% of the enrolled children in 2010 demonstrates that the previously existing gaps between the rural and urban areas has been closed. Another indicator regarding the development of education is its share in the public budget. 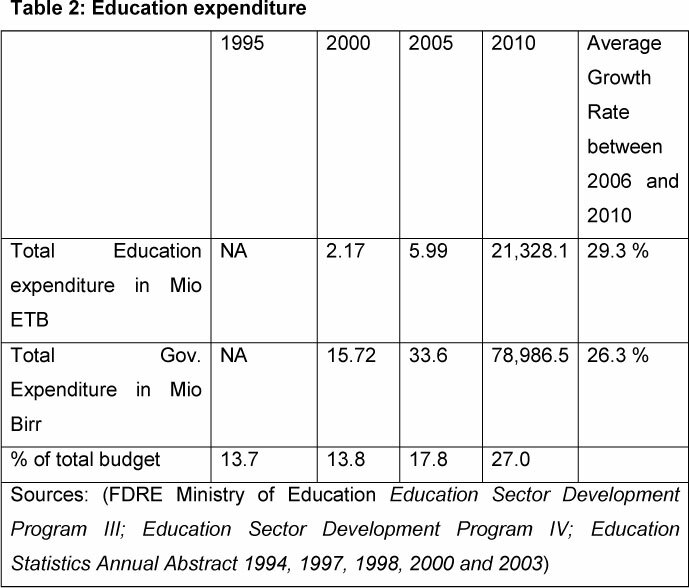 Table shows a constant increase of education's share of the overall budget, the biggest increase taking place between 2005 and 2010, from 17.9% to 27.0%. The increase is not only due to decentralisation but also to the enhanced effort to reach the Millennium Development Goals. The number of primary schools has tripled within 15 years from almost 9 670 to 28 349 schools in 2010, of which almost 10 000 were built between 2005 and 2010. While this increase is not due to the decentralisation policy, it should also be noted that similar efforts were undertaken in the area of secondary and tertiary education as well as in the technical and vocational training sector. One of the achievements of the decentralisation process is the use of the mother tongue as the medium of instruction in primary education. While every child has the constitutional right to mother tongue education, this has been difficult to implement especially in areas where no clear majority language prevails or where there is one majority language and a large number of other languages in insignificant numbers. Research undertaken by MA graduates on Federal Studies at Addis Ababa University has shown mixed reactions to mother-tongue education. Some parents fear that their children will not learn sufficient Amharic or English if they are taught in their mother tongues, while others complain that their children are forced to learn in a language other than their mother tongue because their particular medium of instruction is not available at the specific place. In many cases, however, the provision of mother tongue primary education has helped to increase the acceptance of formal education and has contributed towards the increase in enrolment. It is necessary therefore to shift attention to quality concerns in general and to those inputs and processes which translate more directly into improved student learning and which help change the school into a genuine learning environment (such as: quality-focused school supervision, internal school leadership, increased student participation, school-community partnerships). From the available data and the research undertaken by different organisations such as the World Bank, we can also see that decentralisation has benefitted the most disadvantaged districts most.18In SNNPR, the decentralisation policy in the education sector provided an opportunity to reallocate teachers from the urban to the rural area, thus contributing to the increase in the rural enrolment rates. In Oromia, however, the results especially regarding quality indicators are more mixed. Despite these constraints we may safely conclude that the situation in the education sector has been improved significantly. Some of the issues that remain to be addressed may not be resolved on the decentralised level, as teacher training, for instance, is not dealt with on the local level. Here a better coordination and cooperation between the different levels of government is needed in order to bridge the gap. The health status of the Ethiopian population during the immediate post-federal period was extremely poor, due mainly to the political upheaval the country had experienced under the previous regimes. This was reflected in the conventional health parameters such as life expectancy, the infant mortality rate and the maternal mortality rate. In 1997, for instance, the average life expectancy was 51 (males 49, females 52). While infant mortality ranged from 110 to 128 per 1,000 live births, the under-5 mortality rate was 161 deaths per 1,000, and maternal mortality was 500-700 per 100,000 live births (see Table ). The potential health services coverage and infrastructure in Ethiopia were also inadequate and inequitable. In 1996/97, only about 52% of the population had access to health facilities. There were only 46 public hospitals, 241 health centers and 76 health posts. This resulted in the following ratios of hospitals per population: 1:1,186,061; health care per population: 1:241,149 and health post per population: 1:764,697. Today the situation has improved to such an extent that reaching the Millennium Development Goals by 2015 seems possible. According to the 2011 Ethiopian Demographic and Household Survey19, infant mortality declined to 59 deaths per 1,000 live births, compared with 77 deaths per 1,000 live births in 2005. Under-five mortality levels also decreased from 123 deaths per 1,000 live births in 2005 to the current level of 88 deaths per 1,000 live births. At 676 deaths per 100,000 live births, the maternal mortality ratio is the other area that shows great improvement. The government of Ethiopia issued its health policy in 1993, which aims primarily at providing access to a basic package of quality primary health care services through a decentralised system of governance.25The health policy primarily focuses on prevention, but also includes promotive and curative components. In order to achieve the goals of the health policy, a twenty-year health sector development strategy has been formulated, which is being implemented through a series of five-year plans. This is known as the Health Sector Development Programme (the HSDP). Large amounts of funds are channeled into the health sector through the HSDPs. Over time the expenditure in the health sector increased in terms both of the absolute amount and on a per capita basis. In 1990/91, for instance, the total and per capita expenditure in the health sector were 160,482,165 and 3.3 Ethiopian Birr (ETB) respectively. 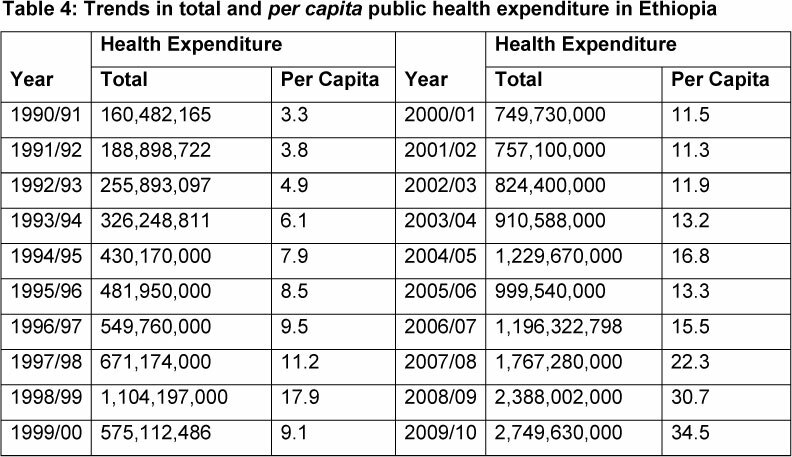 With the start of the decentralisation process government expenditure on health began to increase. At the end of the first phase of decentralisation (2000/01), total health expenditure rose to ETB 749,730,000 and the per capitaexpenditure became ETB 11.5. In 2009/10, the per capita expenditure reached ETB 34, showing an average annual increase of 13.1% for 19 years, while the total expenditure reached ETB 2,749,630,000, registering a 16.1% average annual increase. By the same year the share of the health budget as a proportion of the total government budget was 10%, making the sector the fourth most important sector in terms of budget share. Following the increase in government expenditure, the overall performance of the public health system of Ethiopia has improved. There has been a substantial increase in the potential health service coverage (Table ). 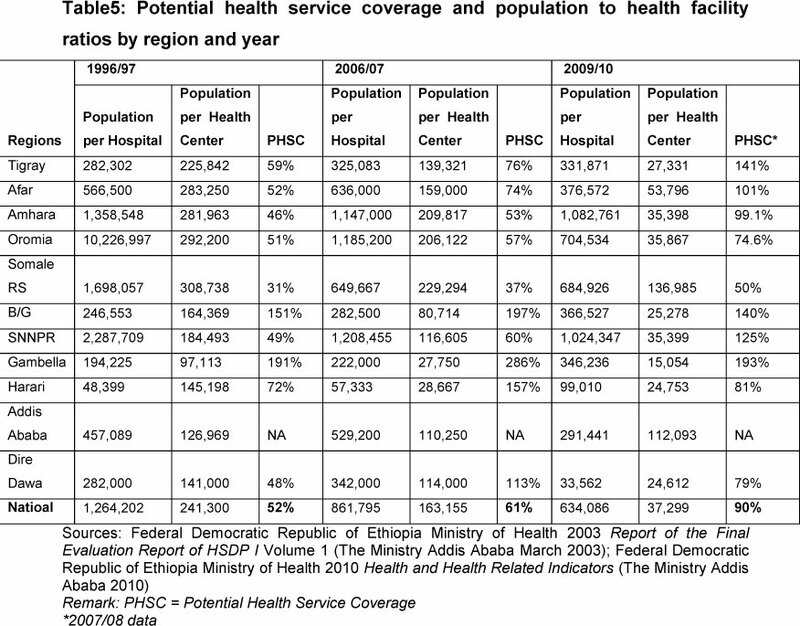 In 1997/98, only 52% of the Ethiopian population had potential health service coverage. The coverage rose to 70.7% in 2001/02 and 90% in 2007/08, showing a 5.1% average annual increase. Similarly, the construction of health facilities increased steadily. Between 1996/97 and 2009/10 the number of hospitals increased from 46 to 126, health centers from 241 to 2,142, and health posts from 72 to 14,242. This has increased the health facility to population ratio significantly. Impact indicators of the health sector such as life expectancy, infant mortality, under 5 and child mortality rates also show positive trends. Life expectancy at birth increased from 52 in 1996/97 to 55.4 in 2009/10. Within the same time period, infant mortality declined from 117 to 69 while under 5 and child mortality rates went down from 161 and 600 to 104 and 478 correspondingly. The regional distribution of potential health service coverage in Ethiopia is provided in . Except for Benshangul Gumuz, all regions have shown great improvements. Tigray, Afar, Benishangul Gumuz, SNNP and Gambella have full potential health services coverage, while in other regions more than 70% of the populations of Amhara, Oromia, Harri and Diredawa have potential health service coverage. Somale Regional State is the worst performing region with only 50% of the population having access to health services. This is mainly due to the fact that the region is relatively politically unstable and conflict prone, and is also facing capacity-related constraints. The public health care system of Ethiopia has seen significant achievements since decentralisation started. This holds true for both quality and quantity. As in the education sector, studies see an increase in public satisfaction with the services provided since decentralisation started.28The health system has improved both in terms of coverage and equal access. The decentralisation policy adopted by the country has played a pivotal role in the realisation of this success. Decentralisation has enabled sub-national governments to play a role in the provision of health services. It has also allowed regional and woreda-level governments to raise and spend a significant amount of fiscal resources, so that they have taken part in improving the health service. In this way they have improved the health status of their population while at the same time contributing to the overall development of the country's health sector. But it would be a mistake to conclude that decentralisation was the only factor responsible for the change, since there are quite a number of other government policies and programmes that definitely have had positive impacts on the performance of the sector. Ethiopia is a case where a system change from a military dictatorship was possible after the military defeat of the dictatorship. The country then underwent a transition from a unitary state through a decentralised state into a federation which was established through the Constitution of 1994 and came into being in January 1995. In order to improve the efficiency of service delivery, a process decentralising various powers from the regional states to districts (woredas) started in 2001/02 in four regional states: Amhara, Oromia, Tigray and SNNP, followed by the other regional states in subsequent years. This article has looked at the effects of the decentralisation in two major sectors: education and health services. In both cases we have found an overall increase in allocated budgets and an increase in the scale of the services offered since decentralisation started in 2001. Studies also show that the increase in services is not homogenous across regional states. Within the four larger regions, strongly disadvantaged woredas at the outset of the decentralisation process have profited most, which shows that the constitutional imperative of equal access to services is being implemented. Some of the regions where decentralisation was started later have still not caught up with the other regions, a phenomenon which is mostly due to capacity deficits. In conclusion we can safely state that decentralisation in combination with consistent development policies has led to an overall improvement in service delivery, while some challenges regarding quality and equity still need to be addressed. 1 Based on the 2007 Housing Census, the exact figure was 73,750,932 in 2007 (FDRE CSA Summary Report of the 2007 Housing Census). 2 Aalen 2006 International Journal on Minority and Group Rights 243-261; Habtu 2004 Dialectical Anthropology 91-123; Fiseha Federalism and the Accommodation of Diversity. 3 Zewde History of Modern Ethiopia. 4 Zewde History of Modern Ethiopia. 6 Chole "Key-Note Address" 166; Negussie Fiscal Federalism. 7 Degefe 1994 Ethiopian Journal of Economics. 8 Woredas correspond to districts, and zones coordinate several woredas. The smallest unit is called kebele, which is equivalent to municipalities. Larger municipalities or cities consist of more than one kebele. 9 World Bank Project Appraisal Document. 10 World Bank Project Appraisal Document.bid. 11 Garcia and Rajkumar Achieving Better Service Delivery. 12 Teshome "Review of Education Policy" 47-92. 13 Garcia and Rajkumar Achieving Better Service Delivery. 14 FDRE Government Education and Training Policy. 15 FDRE Ministry of Education Education Sector Development Program IV. 16 Garcia and Rajkumar Achieving Better Service Delivery. 17 FDRE Ministry of Education Education Sector Development Program IV. 18 Garcia and Rajkumar Achieving Better Service Delivery. 19 FDRE CSA and ICF International 2011 Ethiopia Demographic and Health Survey. 20 Transitional Government of Ethiopia Health Policy. 21 Transitional Government of Ethiopia Health Policy. 23 Garcia and Rajkumar Achieving Better Service Delivery. 24 Garcia and Rajkumar Achieving Better Service Delivery. 25 Transitional Government of Ethiopia Health Policy. 26 FDRE Ministry of Health Health Sector Development Program II. 27 FDRE Ministry of Health Health Sector Development Program III. 28 Garcia and Rajkumar Achieving Better Service Delivery.